I use a lot of spice mixtures such as garam masala, biryani masala and tandoori masala in my cooking. But I hate using prepackaged shop bought spices as they don't have the same aroma that freshly ground spice mixtures do. There is nothing better than the fragrance that is released from freshly roasted ground spices. 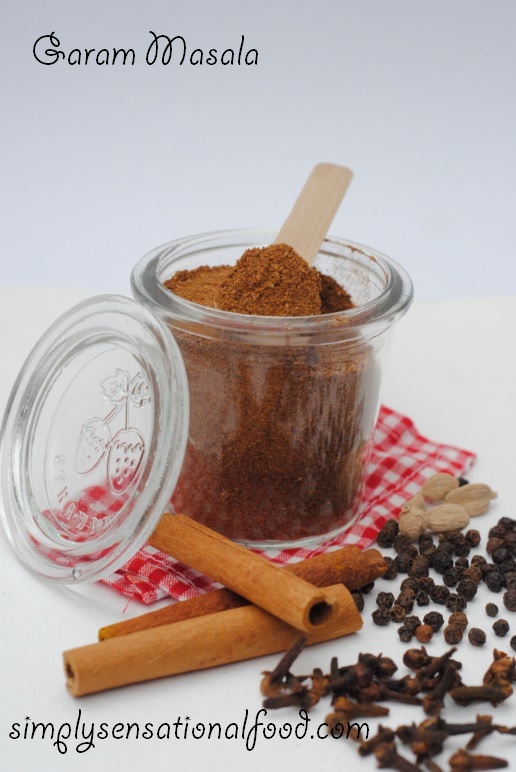 To make your own spice mixture, it is better to make it in small quantities as over time the spice will loose it aroma.Always store spices in an air tight sterilised glass jar. To grind your own spice a good quality coffee grinder is essential. It should have a strong blade and a pulse operation. Spices such as cinnamon should be broken into small pieces. Before grinding spices, dry roast the individual spices in a pan on a low heat, constanting tossing the mixture so that the spices start to release the aroma.Once spices are roasted , allow them to cool to room temperature and then grind them to a powder in the coffee grinder using the pulse button, this ensures that the motor does not burn out and you can control the texture of the spice mixture whether you want it fine or coarse. 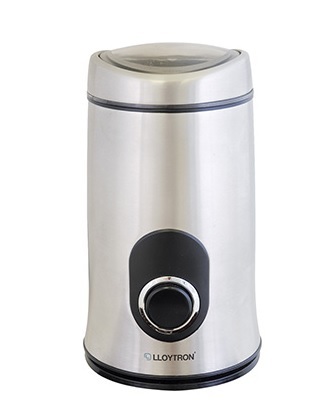 I love the Lloytron coffee grinder from Qwerkity, it is a stylish coffee grinder for the kitchen with a powerful and quiet motor. It has stainless steel blades with a pulse operation which is perfect for grinding spices and coffee.The grinder comes with a a transparent easy-view lid and it has an integral cord tidyfor easy storage. The Llottron coffee grinder is the perfect gadget for any foodie. It retails at £ 24.99 and is available from Qwerkity. 1. In a heavy bottom pan dry roast the spices on a low heat for 10-12 minutes until thy start to release a spice aroma. 2. Remove the spices from the heat and transfer them to a plate and allow them to cool to room temperature.3.Once spices are cooled transfer them to the coffee grinder and grind them to a fine powder.4. Transfer the garam masala to a sterilised glass jar with an air tight lid and store in a cool dry place.Use the spice mixture to flavour, curries, rice or soup. I was sent the coffee grinder by Qwerkity to review, all the opinions and thoughts shared in this post are my own and unbiased. I've ever thought to make my own garam masala. I would love to make my own pumpkin spice mix though. Looks like a cool gadget! I am not one for spices but my daughter is getting really into them, so I guess it's time I learned how to cook with them. I also love adding freshly ground spices to a dish.. this coffee grinder sounds perfect to grind small quantities of spices..
homemade and fresh is always better. Home made is always the best.. BTW I have the same grinder too. I bet your house smells amazing! Definitely added this to my wish list! grinding your own spices means they are always so much fresher, lovely to make up spice mixes too. That looks like a handy little grinder. I've not used spices for a while. The grinder sounds a very good idea. I had no idea how to make fresh garam masala...and I cook curry dishes all the time! What a helpful blog and I feel like you were speaking directly to me, since I already have a coffee grinder similar to that one. Agreed, homemade is always the best. Great little gadget you have there! That spice grinder looks really nifty. I grind our spices in an ancient coffee grinder, but it makes for quite a coarse result. Making your own spices freshly as needed sounds like a great idea. This gadget will definitely speed up the process. I use my coffee grinder to grind both coffee and spices. I've even experimented with adding some spices to the coffee beans before grinding - two or three cloves brings a rich warmth to the flavour. A handy little kitchen gadget for foodies. I've never yet made my own spice blends but have really wanted to try. That looks like a great recipe. And thanks for the grinder recommendation. Looks like a cool gadget, but my first thought it my froothie can do that. It is so difficult to find a grinder that works well grinding Indian spices. I will have to take a closer look at this one. I think spices can really add a nice touch to meals although I haven't used them for a while myself. Thanks for the recipe. We are looking for a nice coffee grinder but every time I find something I like, the reviews aren't so great... I will check out your suggestion, thank you. We usually ready mixed garam masala but next time we run out I know where to come, as always have those spices in the cupboard. I have made my own in the past andas you say its much more aromatic than the shop bought stuff. May look out for a coffee grinder soon and make some more.